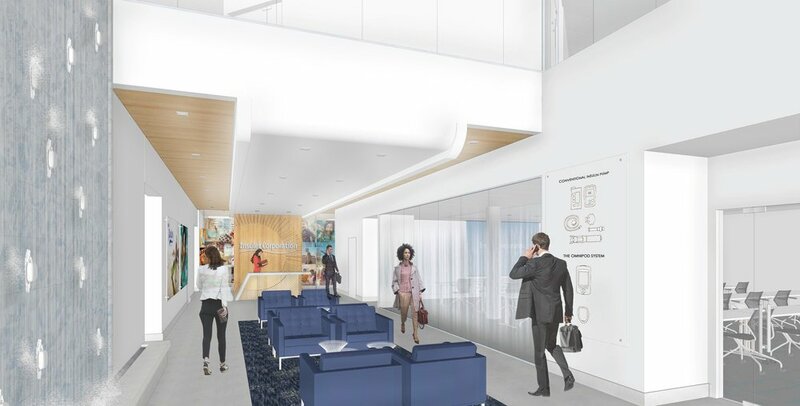 ci design is currently working on the new corporate headquarters and manufacturing facility for Insulet Corporation, makers of a tube-free insulin and oncology drug delivery system known as a “pod.” This project, in phased construction through Fall 2018, encompasses 300,000 square feet of corporate offices, labs, and clean room assembly lines. Insulet, a growing advanced technology company, fosters an environment of collaboration within their corporate culture across multiple teams at multiple sites around the world. Developing a successful Workplace Strategy for Insulet required an in-depth understanding of their workflow and the spatial relationships that best support their mission. Insulet teams meet frequently, both formally and informally, and the design team carefully balanced departmental programming and provided meeting spaces tailored to each scheme. For Insulet, cultivating a dynamic atmosphere where staff can easily meet is critical. Working closely with stakeholders, ci design created design and square footage standards footages for huddle rooms, project war rooms, and small, medium, and large conference rooms. Integrated A/V technology was also included in the meeting room templates. Another component of Workplace Strategy design is furniture, fixtures, and equipment (FF&E). After cataloging and programming different required spaces, the team developed standards for the furniture that accompanies each use. In the varying office types, for example, user input dictated the amount of work surface and storage needed as well as desk configuration. Insulet can now follow this template when outfitting new offices. 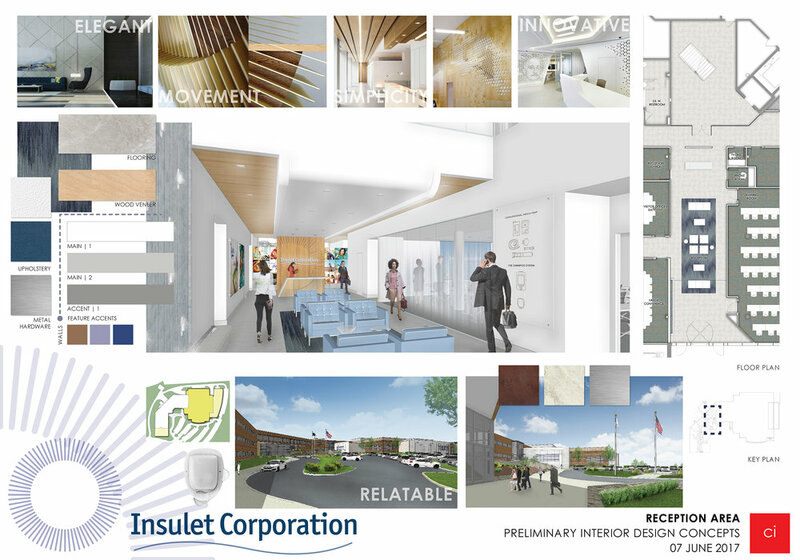 For the design aesthetic, Insulet requested that their branding be incorporated into various project elements. The overall design combines corporate iconography and colors to unify the experience with Insulet’s brand identity. Design features, such as the main reception desk and the employee cafeteria, are geometrically inspired by Insulet’s egg-shaped drug delivery pod. 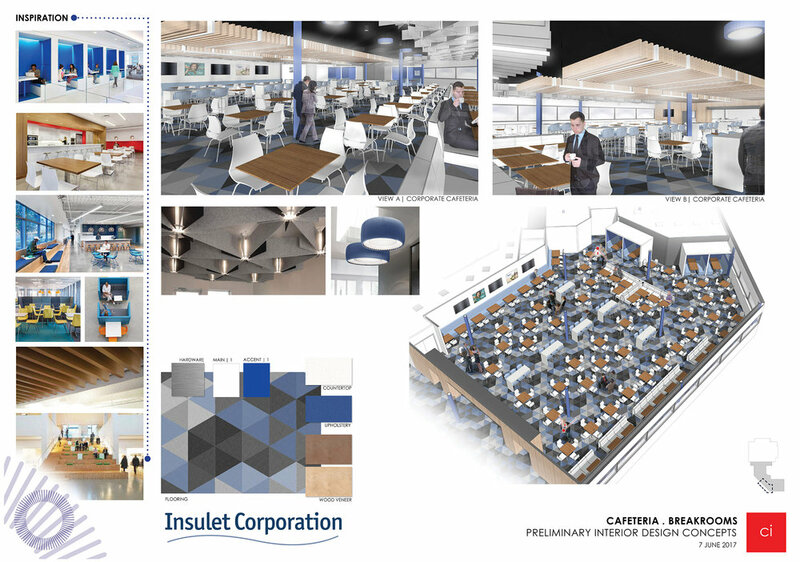 In the cafeteria, custom ceiling baffles are arranged to evoke the stylized contours of Insulet’s flagship product.